The Board’s mandate is “to ensure that an integrated national brand is created, harnessed and sustained in the long term”. A large number of state institutions – from the Airports Authority to the Tea Board – are participating, and Kenya’s foreign missions (mostly embassies and consulates) have been tasked to collaborate. Kenya has a solid base (exports, tourism and Out of Africa!) on which to build, and the initiative seems like a strong move in the right direction. If countries with the potential (“assets”) and the capacity to engage in brand-building do so, there is hope that the negative stereotypes about “Africa” can be reversed, even if only on a regional basis. If drug companies sign on, purchasers of prescription drugs will be able to text message a unique bar code number on the package to a service provider and receive an immediate confirmation that it is (or is not!) what it claims to be. Two providers (mPedigree and Sproxil) will be testing competing services later this year, and both Merck and Glaxo-SmithKline are interested. This new service, if implemented, will address at least part of the problem we commented on in February https://casipblog.wordpress.com/2010/02/10/africa-as-a-dumping-ground-for-counterfeit-goods. According to the Financial Times, the number of mobile telephones in Africa rose from 15.6 million in 2000 to 135 million in 2005. That represents a compound annual growth rate of almost 54%, compared with 24% globally. Between 2005 and 2009, when the installed base had increased to 300 million units, the growth rate slowed to 22%. And a study by the London Business School concluded that an extra ten mobile phones per 100 people in a typical developing country leads to an additional 0.44 percentage points of growth in GDP per person. As cell phones become more technologically advanced, they will become the top tech platform for the large majority of the world…. Mobile devices and networks, however, will be vulnerable to malware, hacker attacks and theft, just like computers are today. From Benin to Thailand, Burkina Faso to Tanzania – the National Partners Initiative (the NPI, launched and coordinated by CAS-IP) has produced a unique collection of “insiders’ info” about the IP systems of the countries of Asia, Africa and Latin America. Please note the disclaimer that this compendium is not an official representation for these IP systems. However, links are provided so that the proper governmental offices can be contacted. You can view the publication posted on the CAS-IP slideshare site by clicking on the image. This document is a first draft and the group will update over time. However, such a wealth of information should be shared – so please forward this link to whoever you feel might benefit from the information! Those of us that work in the area of intellectual property (IP) often long to find sources that cover a collection of information where it is easy to find what we want, is dependable, and is concise. This Compendium is that sort of work, (that we hope to update on an annual basis). The IP systems of thirteen countries located in Asia, Africa and Latin America are briefly described, with a chapter on the European and U.S. system for comparative purposes. Links for official governmental (on-line) sites are provided for those that need official information. It represents the work of members of the National Partners Initiative (NPI), a community of intellectual property (IP) practitioners. The NPI is supported by its members and the funding generosity provided by the Directorate-General for International Cooperation (DGIS), Ministry of Foreign Affairs of the Netherlands and the Centers of the Consultative Group on International Agricultural Research (CGIAR), through the CGIAR-Central Advisory Service on Intellectual Property (CAS-IP). 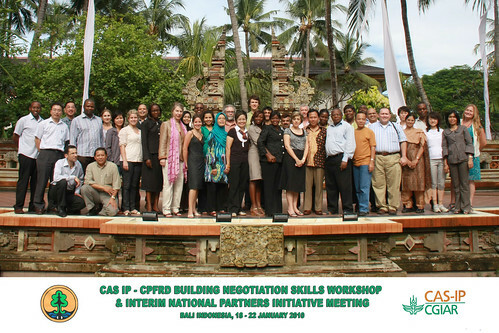 CAS-IP launched the National Partners Initiative in 2007. Since then this group of international IP practitioners has met twice a year to share experiences and leverage one another’s knowledge. Again, special thanks to DGIS who provided the financial support to make this initiative possible. Below is the most recent photo of the group taken at the skills workshop that took place earlier this year. “The main aim of this new agreement is to ensure that scientific and technological advances and agricultural research will be made available to the world’s 450 million smallholder farms, on whom depend the livelihoods of over 2 billion rural poor people. For the full press release visit the lead link.